A pioneer of Korean abstract art, Kim Whan-ki, has once again broken the record for the most expensive piece of Korean art sold, confirming the artist’s lasting global appeal. 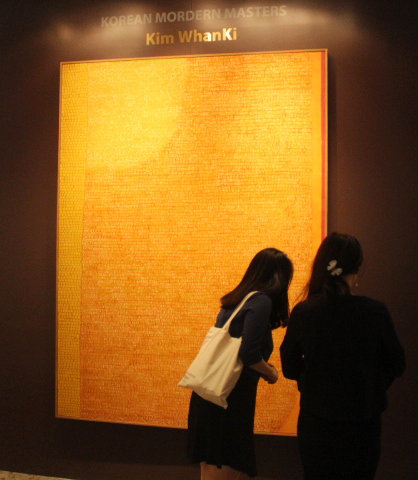 His yellow dotted painting “12-V-70 #172” was sold for 6.32 billion won ($5.36 million) at Seoul Auction’s 20th Hong Kong Sale at the Grand Hyatt Hong Kong on Sunday. The painting garnered significant attention from buyers even before the auction opened over the weekend. The 1.73-by-2 meter piece, created in 1970, is a rare yellow color, whereas most of Kim’s dotted oil paintings boast a blue shade. With this sale, Kim now holds the records for the five most expensive Korean paintings sold. The third priciest painting is “Untitled” from 1970, sold at 4.86 billion won, and in fourth place is “19-VII-71 #209” from 1971, sold at 4.72 billion won. The fifth most expensive painting, “Untitled 3-V-71 #203,” is also from 1971 and was sold at 4.56 billion won. Kim, born in Korea in 1913, passed away in 1974 in New York. He led the first generation of Korean abstract artists, mixing oriental ideals and Korean Lyricism with abstraction. His artwork is largely characterized by different hues and patterns that fill the canvas. A museum dedicated to Kim -- the Whanki Museum -- opened in Seoul in 1992. He is also distantly related to K-pop star T.O.P of boy band Big Bang. Korean monochrome art by artists Chung Sang-hwa and Yoon Hyung-geun also enjoyed popularity at the Hong Kong Sale. One of Chung’s pieces sold for 900 million won, while two of Yoon’s pieces sold at double the starting price. Proponents of “critical realism,” which reflects contemporary Korean society, were also had favorable responses, with works by Hwang Jae-hyung, O Yoon, Kwon Soon-chul and Lee Jong-gu all sold to global buyers. The Hong Kong Sale saw a 69.2 percent successful bidding rate and raised 17.9 billion won. The 142nd edition of the major Seoul Auction is set to take place on Dec. 14 at its headquarters in Pyeongchang-dong, Seoul.